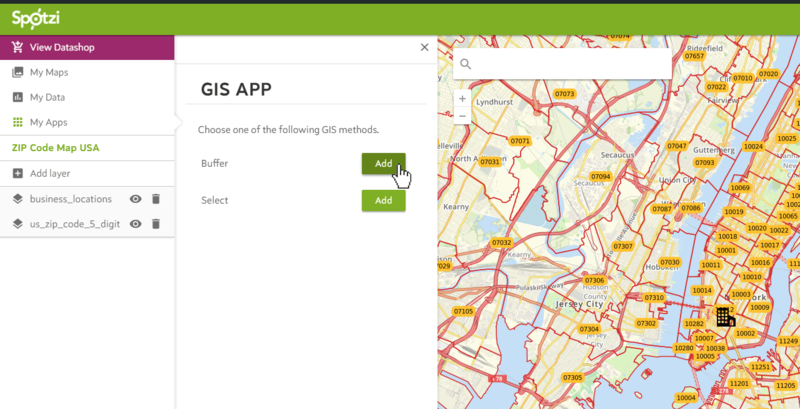 How to use the buffer functionality in the GIS app? In this example we have a map with the location of Jack Demsey’s in New York City. 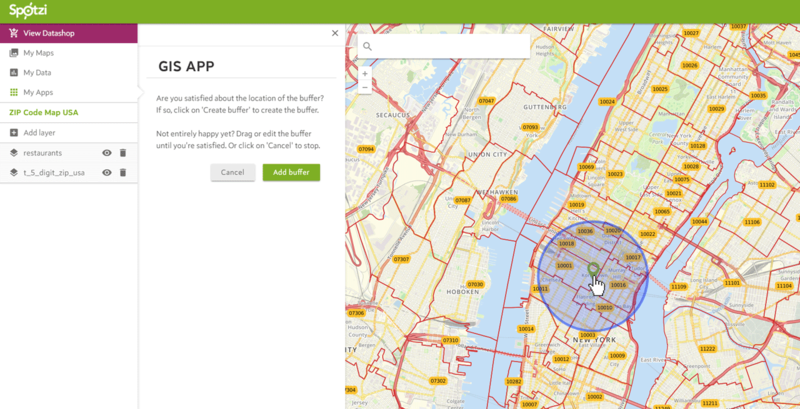 By using the buffer functionality of the GIS app we can find all the ZIP code areas within 1 mile from the restaurant. 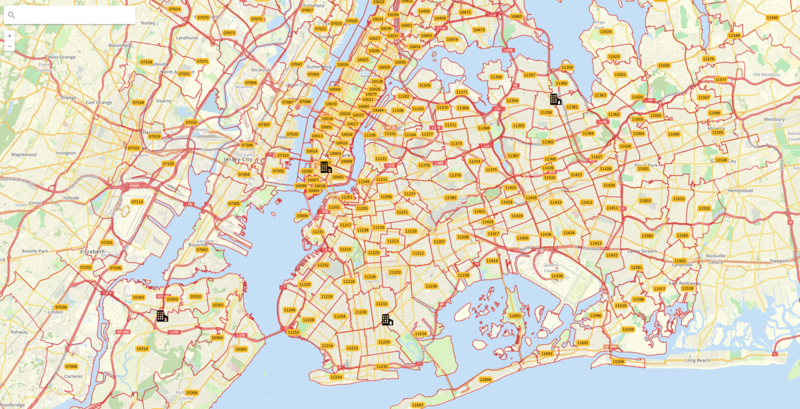 Below you can find a step-by-step guide on how to create a 1 mile buffer around the restaurant and how to create a filter to only select the areas within this 1 mile radius. 1. 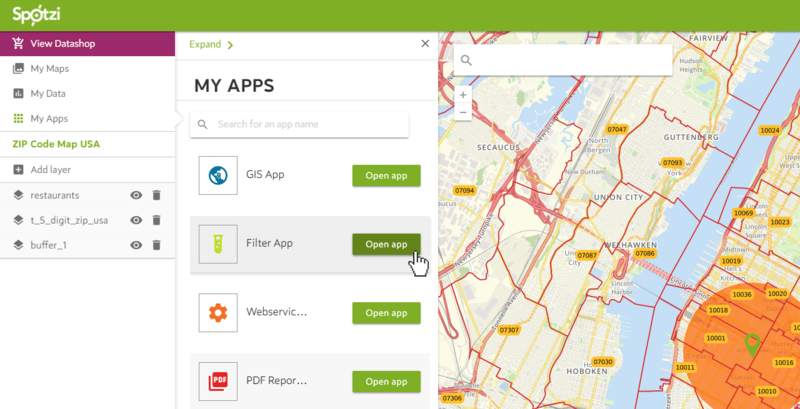 Select a map and open the GIS App from your My Apps menu. 2. Now add a buffer. 3. 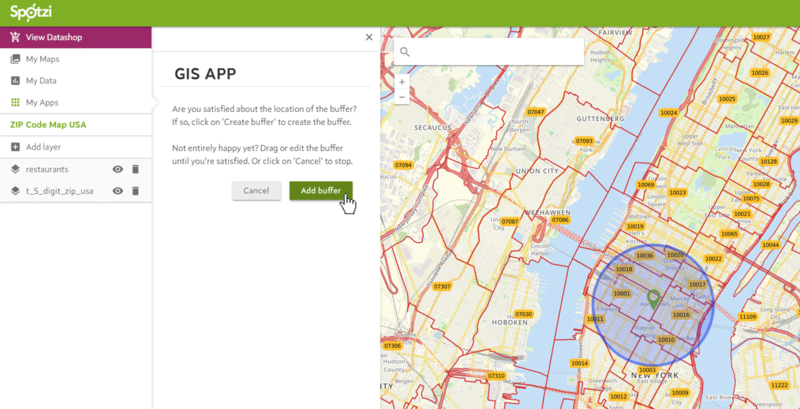 Choose the option to place a buffer on the map with a 1 mile radius. 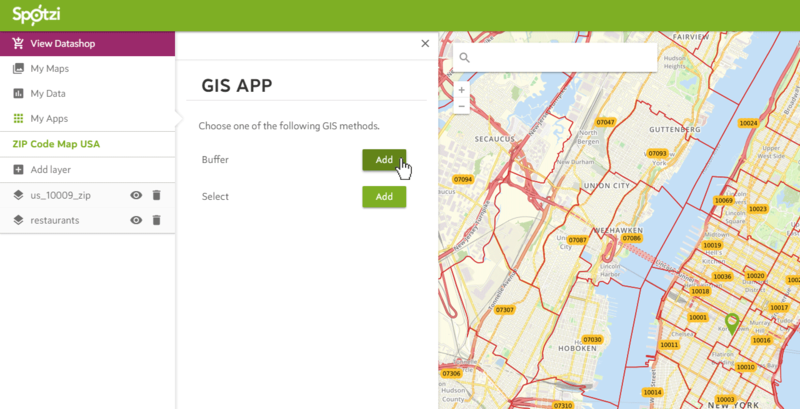 In this example I choose to create a new map layer for my buffer. To start creating a new buffer, press CREATE BUFFER to confirm. 4. 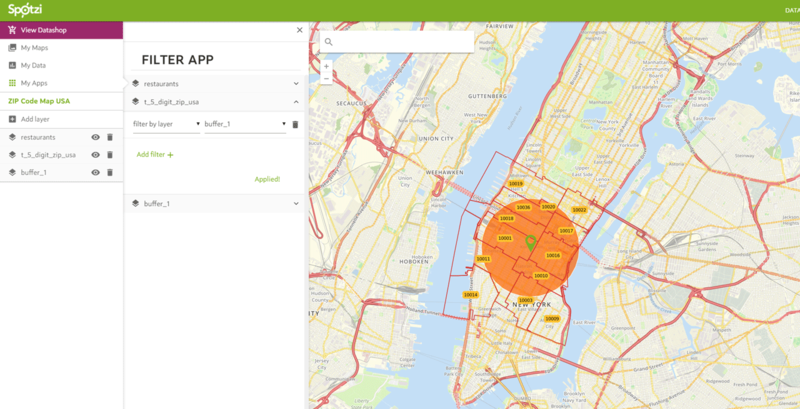 Now select where you want to place your 1 mile radius. In this example I will create a new radius around the restaurant. 5. Now click ADD BUFFER to confirm. 6. Now name the new layer with the buffer. 7. We have successfully created a 1 mile radius around the restaurant. 8. 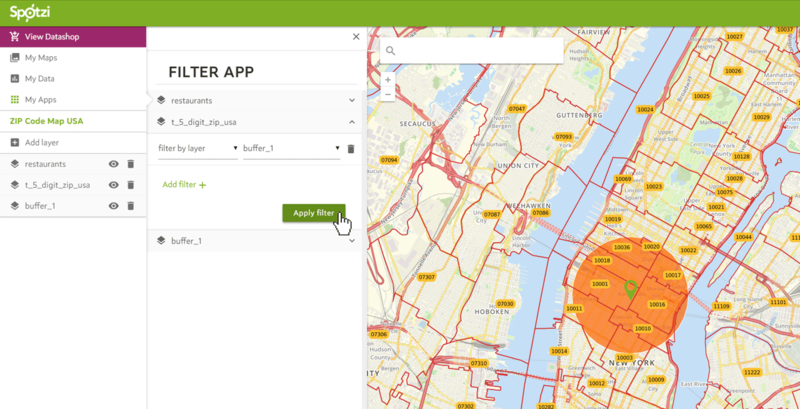 If you only want to see the ZIP code areas in your specific radius you need the filter app. Open this app. 9. Once you have opened the filter app. Pick the data layer you want to filter. In this example I have selected the 5-digit ZIP code layer of the US and picked the option to filter by layer. 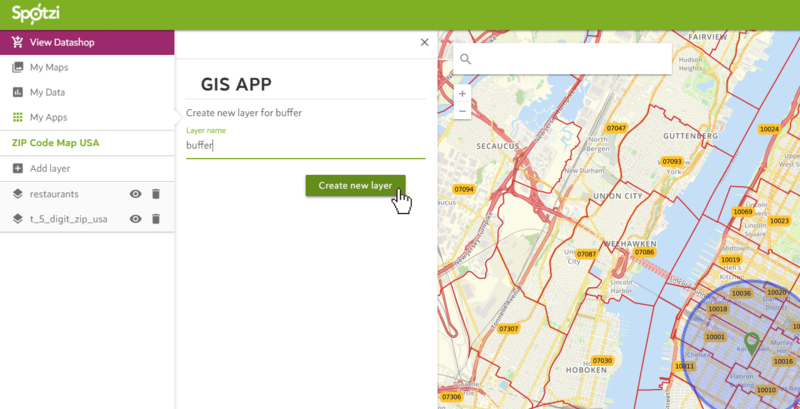 Here I select the new buffer layer I just created. Press APPLY LAYER to confirm. 10. Now you have successfully filtered out the ZIP codes within a 1 mile radius from the restaurant. If you want to create an Excel/CSV list with all the ZIP codes within a specific radius please use the export option with that particular filtering option turned on. 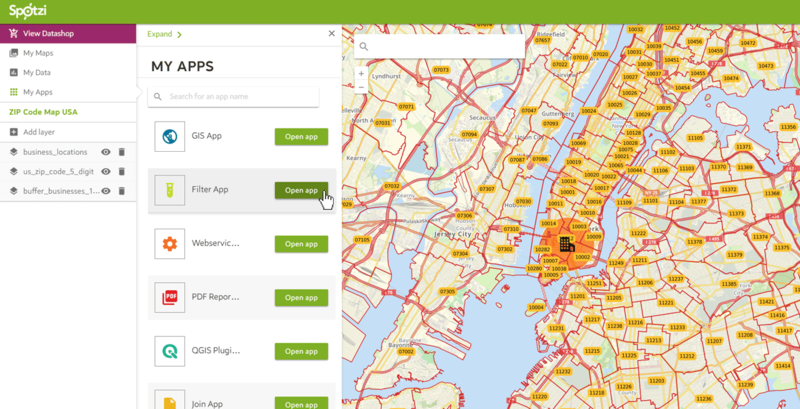 This allows you to create a list of all ZIP codes within a radius. 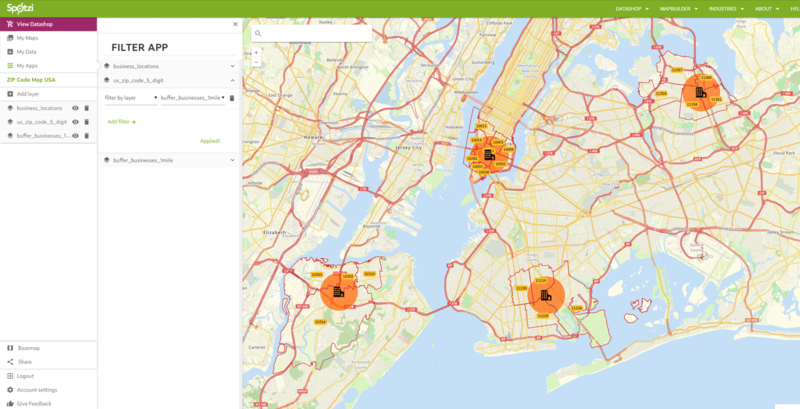 In this example we have a map with multiple business locations in New York City. 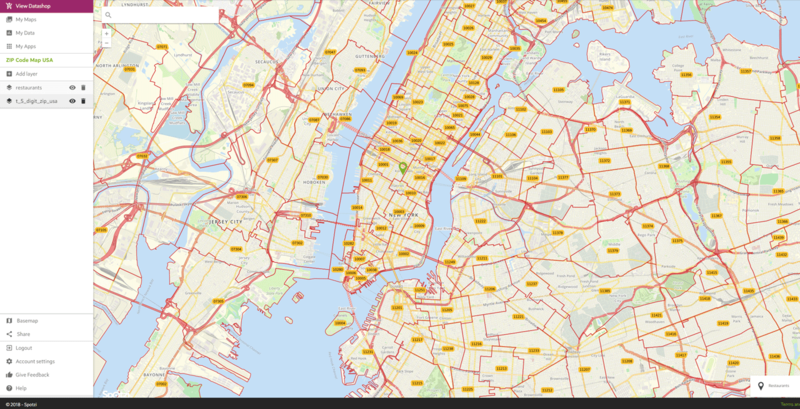 Below you can find a step-by-step guide on how to create a 1 mile buffer around every location plus how to create a filter that only shows ZIP code areas within that particular radius. 3. 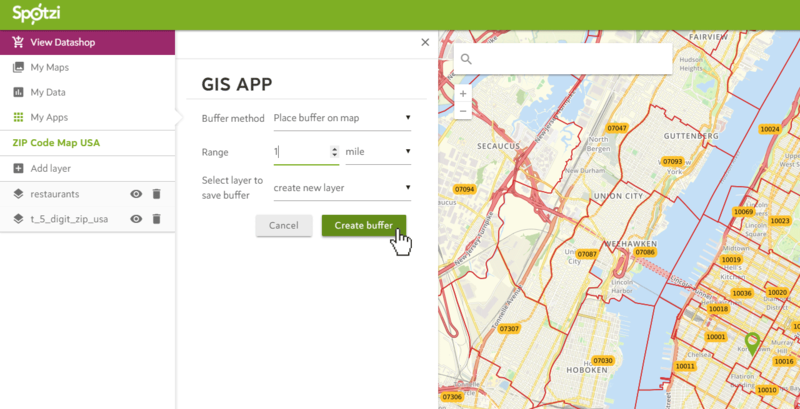 Choose the option to place a buffer on a layer with a 1 mile radius. 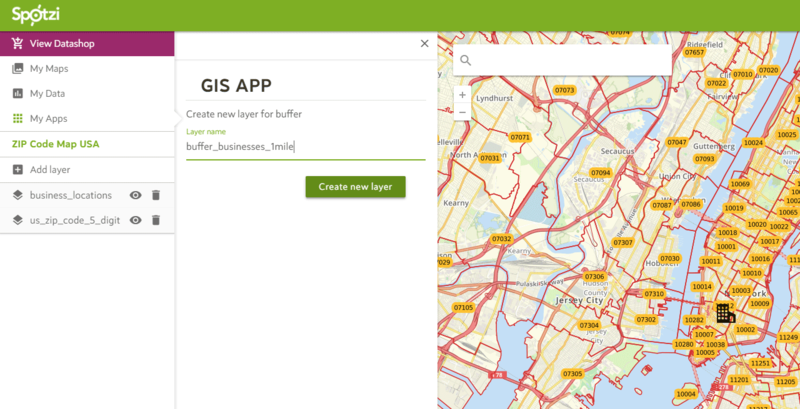 In this example I choose to create a new map layer for my buffer. To start creating a new buffer, press CREATE BUFFER to confirm. 4. Now name the new layer with the buffer and press CREATE NEW LAYER to confirm. 5. 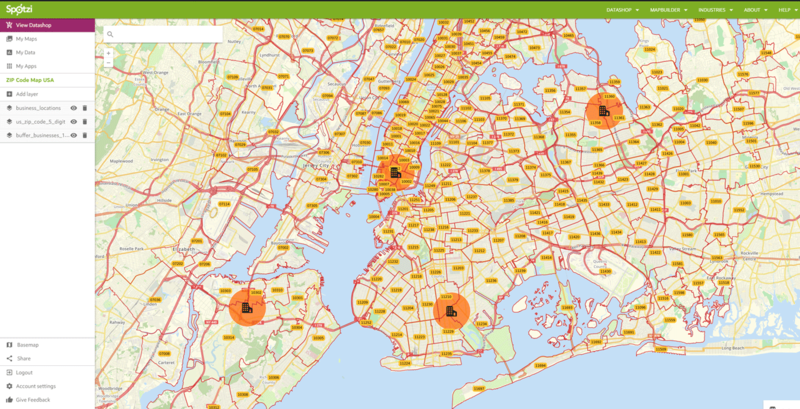 We have successfully created a 1 mile radius around every business location. 6. If you only want to see the ZIP code areas in your specific radii you need the filter app. Open this app. 7. Once you have opened the filter app. Pick the data layer you want to filter. 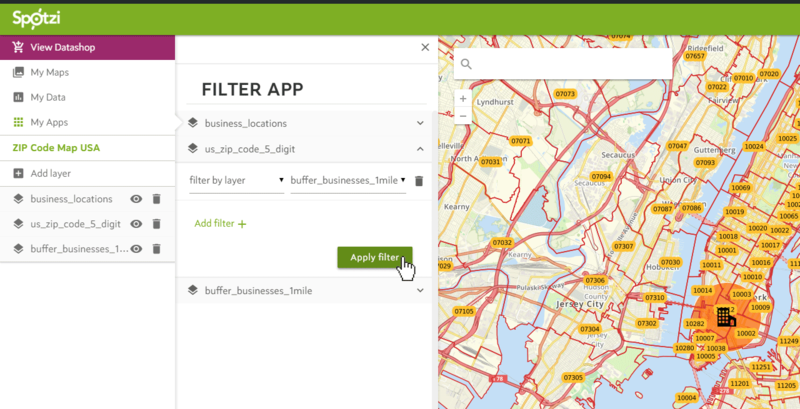 In this example I have selected the 5-digit ZIP code layer of the US and picked the option to filter by layer. 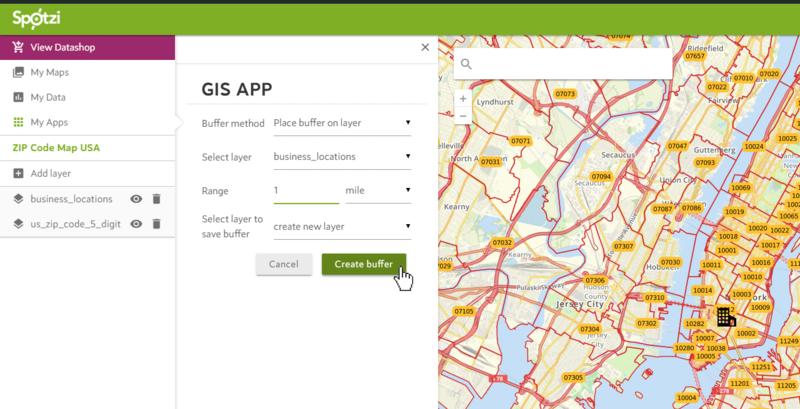 Here I select the new buffer layer I just created. Press APPLY LAYER to confirm. 8. 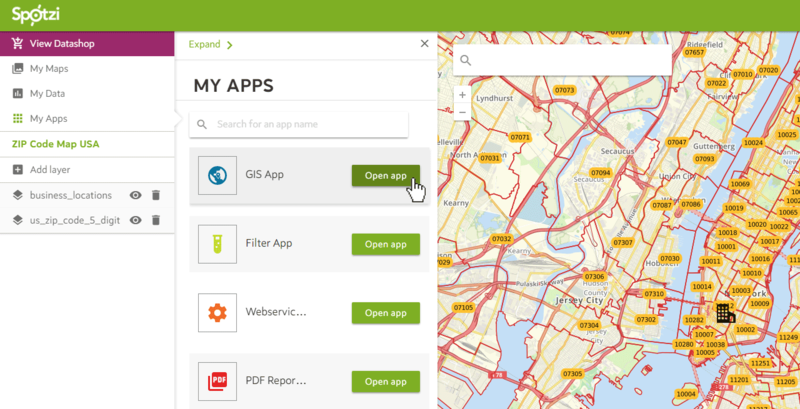 Now you have successfully filtered out the ZIP codes within a 1 mile radius from your business locations. 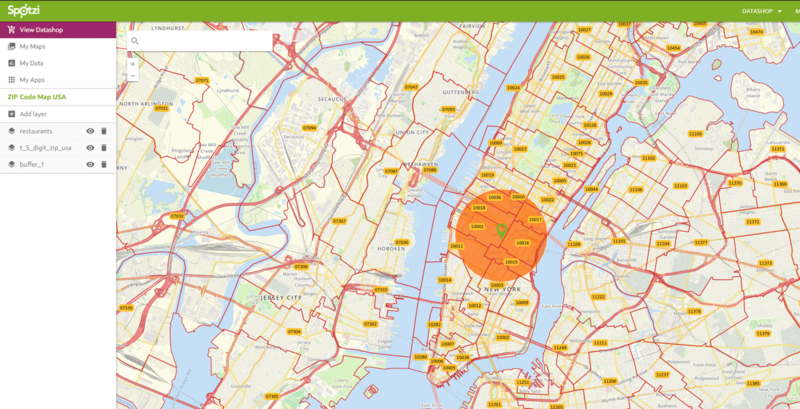 Do you want to know more about the population within a certain radius from your business? 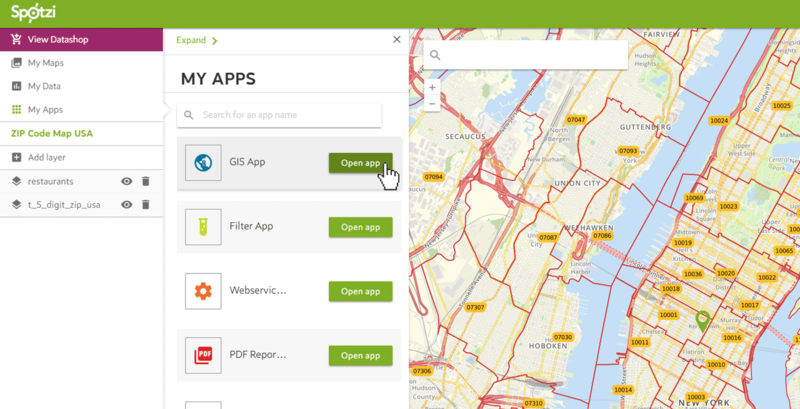 Use our demographics data with our GIS app.